"New" pupils - NZSSSC school team criteria: the NZSSSC school team eligibility criteria came into effect from Term 2 of 2007 and were revised by NZSSSC for 2011 and again for 2012. During the 2013 AGM NZSSRA added an exception to the criteria to our Rules (Rule 2.4). The criteria apply to our three Championships regattas, North/South Island and Maadi (New Zealand) Secondary School Championships, which are all NZSSSC sanctioned. An article about pupils new to a school is available to help members work out which, if any, of their pupils are affected by the NZSSSC school team criteria. Gearing: Following on from robust discussion at the 2006 AGM about sweep oar rowing and our members' youngest pupils we have an excellent article on gearing. 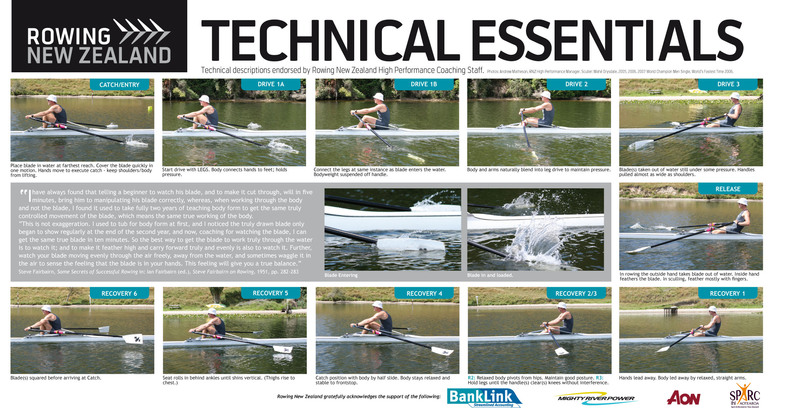 A properly geared boat reduces the stresses faced by rowers, and should also go faster! If you have an article you think the school rowing community might find useful please let us know at [email protected]. We will be happy to consider your submission for inclusion on our website. If you are interested in how the NZSSRA is run then you should read our constitution. Along with the governing Articles, our constitution contains regulations for regattas held under the auspices of the NZSSRA and the rules for racing and the safety system for use at those regattas. In addition we have a set of tables for progression systems, which are used to ensure major regattas are completed in a timely manner. And to make sure you have access to all the relevant documents we have also included the forms that are listed in the appendices of the constitution. NZSSRA members are also members of the New Zealand Secondary Schools Sports Council. In addition our Championships regattas are sanctioned by the NZSSSC. The NZSSSC constitution [.pdf 74KB] contains policies and guidelines for secondary school sports; including the new pupil eligibility criteria introduced at NZSSRA Championships in 2008. A couple of times each year the NZSSRA puts out a newsletter to our member schools. The most recent newsletter is always available. Some of the past newsletters can be found in the archives. In addition to newsletters we also occasionally carry notices. These have been for such things as requests from people seeking coaching positions and offers of rowing related goods. Historical constitutions, AGM details and items and articles that are no longer current have been retired to the archives.